When a star dies and erupts as a supernova it can produce a short, sharp shockwave that astronomers call a “shock breakout.” For the first time ever, astronomers have captured such an event as optical light. When a red supergiant star runs out of fuel and can no longer sustain itself, gravity causes its core to collapse in on itself. This creates what’s known as a Type II Supernova, as the star explodes in a fiery death. While the process of the explosion can take weeks to reach full brightness, it often begins with a short, sharp blast of light, created as the shockwave generated by the collapsing core reaches the surface of the star. The artist’s representation above shows what happens during the breakout. A team from University of Notre Dame in Indiana has been studying reams of data captured by the Kepler space telescope, inspecting as many as 50 trillion stars in the process. 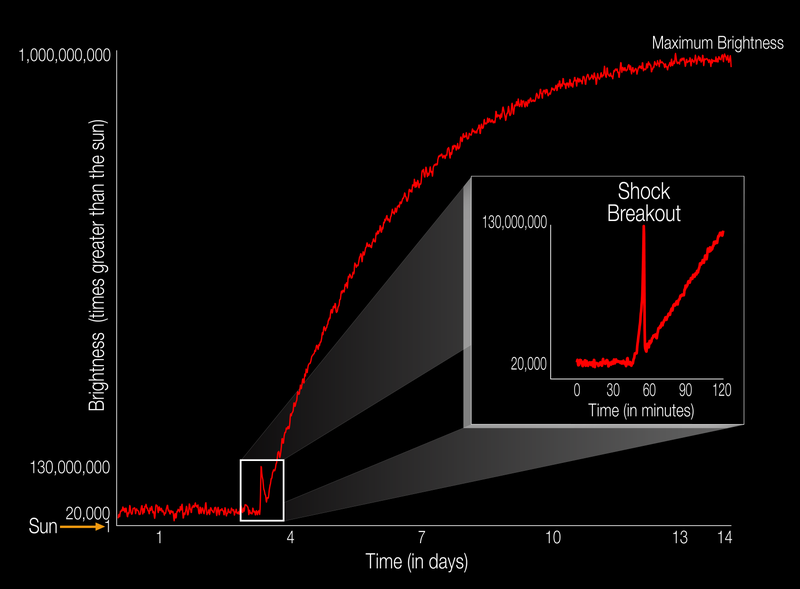 During that study, they came across a shock breakout event occurring within the star KSN 2011d. You can see the short burst of brightness in the graph below, which occurs before the steady increase associated with the growth of the supernova. It’s kind of amazing that the team managed to catch it when you look at this time axis in the graph: The whole thing was over within just 20 minutes. The research is published in Astrophysical Journal.